We’re fortunate to live in a time where the downfield pass is king in the NFL. Ten years ago, when running backs still ruled, only eight quarterbacks averaged at least 250 passing yards per game, and Drew Brees tied with Philip Rivers for the most touchdown passes thrown by a quarterback, with 34. Thirty-four. Fast forward 10 years; 19 quarterbacks surpassed the 250 passing yards per game mark, and league MVP Patrick Mahomes led the league with 50 touchdown passes, 16 more than the league-leaders a decade ago. Make no mistake about it, the ball is being put in the hands of the quarterbacks more and more, and teams are becoming increasingly reliant on their signal-callers to taking charge of games. With that said, here are some of the best quarterback duels of the 2018 NFL season. To say that the Week 1 clash between the New Orleans Saints and the Tampa Bay Buccaneers started the season with a bang would be an understatement. Combined, Ryan Fitzpatrick and Drew Brees combined for a staggering 856 passing yards (the third-best single-game mark of the 2018 season) and an incredible, season-best big-time throw to turnover-worthy play ratio of 9:0. The game eventually ended in a 48-40 victory for the Buccanneers, but that was no fault of Drew Brees, who finished the game with an adjusted completion percentage of 86.4% and was exceptional from a clean pocket, completing 28 of his 32 clean-pocket attempts for 353 yards, three touchdowns, and a passer rating of 143.9. Ultimately, FitzMagic was too much for the Saints to overcome, as the veteran quarterback excelled in all phases of the game, recording a near-perfect 153.8 passer rating from a clean pocket, a perfect 158.3 passer rating under pressure, and a perfect 158.3 passer rating on his throws targeted 20 or more yards downfield. The inaugural matchup between two of the league’s stars at the quarterback position far from disappointed. The rout ultimately ended in a 37-34 overtime victory for the Texans and second-year quarterback Deshaun Watson, the first time in Watson’s career that he had won a game after his team was trailing at any point. 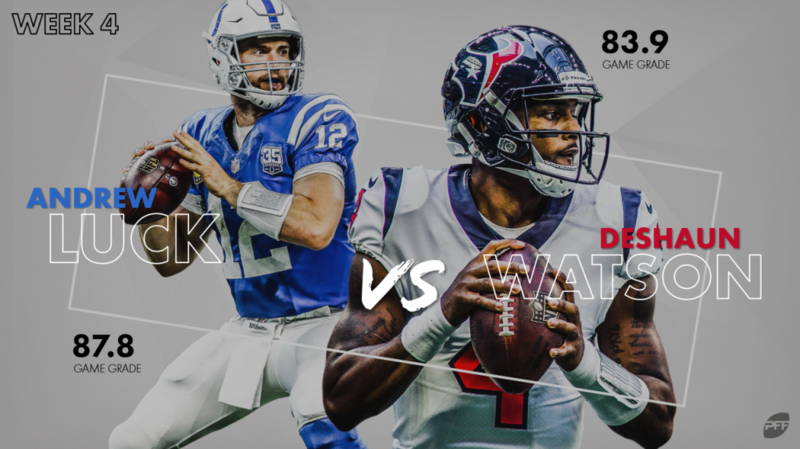 Watson was deadly on his deep passes on the afternoon, completing 4-of-5 attempts for 106 yards including a beautifully thrown go route to wide receiver DeAndre Hopkins. Watson was also dangerous with his legs, as he picked up 33 yards and three first downs on four scrambles. Luck may have ended the game with a loss, but he came out tops in this duel with an overall grade of 87.7 thanks to his stellar play from a clean pocket, where he completed 31-of-47 attempts for 372 yards, three touchdowns, two big-time throws, and zero turnover-worthy passes. While you may remember this game for Daniel Carlson’s three missed field goals and how it ended in a tie, you may have forgotten how good the quarterback play was. Kirk Cousins was dominant in this game; despite getting pressured on 17 of 52 dropbacks Cousins was able to deliver accurate passes all game and he earned an 88.9% adjusted completion percentage on the afternoon. While Rodgers ended the game with a lower grade, he was also near his best and completed 32 of his 40 attempts for 281 yards, a touchdown, one big-time throw, and zero turnover-worthy passes. 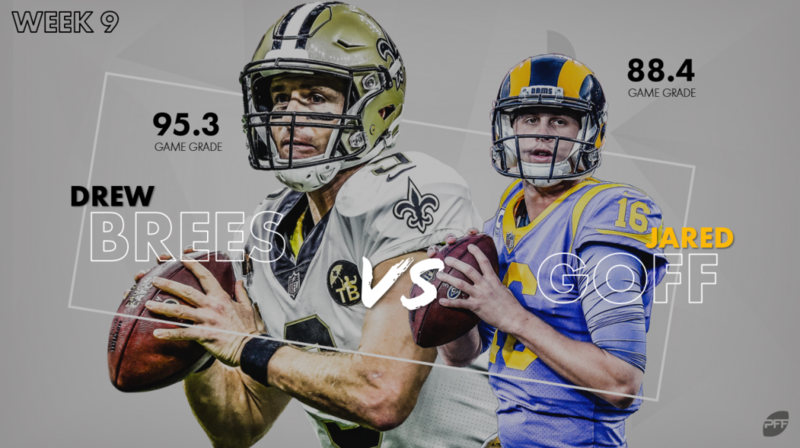 This shootout between the veteran Drew Brees and the third-year Jared Goff delivered one of the best QB battles of the season. The spoils ultimately ended up with the Saints after a 45-35 victory, but the 80-point thriller was a fascinating watch, as two of the league’s best-coached passing attacks battled it out. Drew Brees was spectacular on the night, as was his work targeting the intermediate to deep areas of the field, as he completed 9-of-13 attempts for 210 yards, two touchdowns, and not a single turnover-worthy throw when targeting players at least 10 yards downfield. Goff, on the other hand, carved up the Saints’ defense with the play-action passing game; he completed 11-of-13 play-action attempts for 183 yards, two touchdowns and a perfect passer rating of 158.3 on the night. This TNF aerial assault featured some of the best deep passing of any game this year. Combined, Kirk Cousins and Jared Goff completed 9-of-10 deep passes for 295 yards and a staggering seven touchdowns. Where Goff was able to separate from Cousins was his play when not blitzed. When facing four-or-fewer-man rushes, Goff completed 17-of-18 targeted passed for 301 yards and five touchdowns, which produced an exceptional passing grade of 98.1 – the best single-game mark by a quarterback with at least 10 dropbacks against the four-or-fewer-man rush. 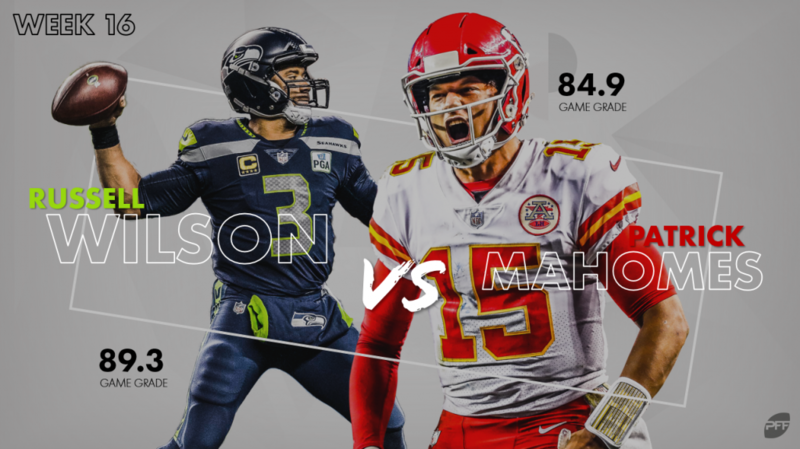 One of Wilson’s best performances of the 2018 season, the Seattle quarterback led his team to a victory with some perfect passes to beat tight coverage. His best pass of the day was a 45-yard deep shot down the sideline to Tyler Lockett, one of the three deep-pass completions that he produced in the game. While the league’s eventual MVP ended the game with a loss and was held in check for the majority of the first half, his performance in the second half was simply stunning. After the break, Mahomes completed 17-of-27 attempts for 191 yards, two touchdowns, and four big-time throws. This showdown between two of the top young field generals was a coming out party for Sam Darnold and another good outing for Deshaun Watson. Darnold played the best game of his career and completed 24-of-38 passes for 253 yards and two touchdowns. Darnold did his best work when he attacked the intermediate range of the field, which is where he gained 54% of his passing yards and earned a mightily impressive passing grade of 96.6. Deshaun Watson, on the other hand, was efficient throughout, and he completed every targeted short pass (0-9 yards downfield) that he attempted. While Watson’s grade wasn’t as good as Darnold’s overall, he was better in crunch time, as he led the Texans to a game-winning drive in the fourth quarter.